Thursday 5th July 2018 – Helped Councillors from Burgh le Marsh judge the Burgh in Bloom competition. 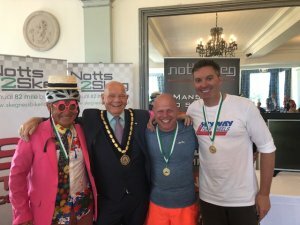 Friday 6th July 2018 – The Deputy Mayor, Councillor Maggie Gray attended the Magna Vitae Bowling Tournaments and helped present the awards to the winners. Saturday 7th July 2018 – Opened the Beacon Primary Academy Summer Fair. Saturday 7th July 2018 - Presented medals to the 70 cycle riders on the Annual Skegness Bike Ride. Sunday 8th July 2018 – Welcomed the "Fighting for Life Lincolnshire" Biker rally to Skegness Hospital where they were delivering biscuits to front line NHS staff and supporting the Lincs & Notts air ambulance. Thursday 12th July 2018 – Was present at the launch of the Skegness Business Awards at Kirks Butchers. 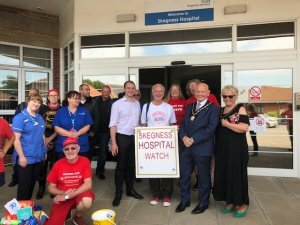 Friday 13th July 2018 – Opened the Annual Skegness Mini Fest at the Welcome Pub. 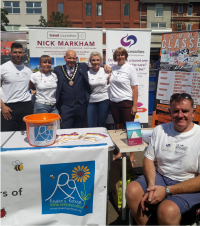 Saturday 14th July 2018 – Was present at the publicity event at the Hildred's shopping centre to celebrate the achievements of Nick Markham. Nick is wheelchair bound but with the help of his friends has recently climbed Snowdon. Saturday 14th July 2018 – Watched the Embassy Theatre Academy end of year show "The Sound of the Musicals". Sunday 15th July 2018 -Attended the annual Butterfly Hospice butterfly release in memory of loved ones at the Crown Hotel. Tuesday 17th July 2018 – Hosted a meet and greet in the Mayor's Parlour for representatives of community groups from the town. 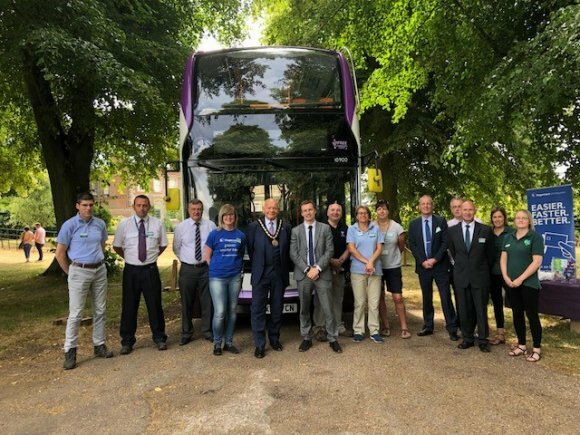 Wednesday 18th July 2018 – Attended the launch event of the Stagecoach Buses walking routes which was held at Gunby Hall. Wednesday 18th July 2018 – Attended the opening of the Carpenters Arms pub in Boston along with the Mayor of Boston. Friday 20th July 2018 – Did an interview with BBC Radio Coventry. Friday 20th July 2018 – Presented awards to students of the Cobra Ju Jitsu club. Sunday 22nd July 2018 – The Deputy Mayor, Councillor Maggie Gray opened the Crime Prevention Day in Tower Gardens. Sunday 29th July 2018 – Opened a concert held at The Village Church Farm to promote REACH (Romanian Emergency Aid & Community Help).